We are a top notch supplier of Raita Masala. From our wide consignment, we are affianced in supplying Raita Masala. In order to meet excellent quality standards, we are supplying Raita Masala. Our company has been successful in winning appreciation from the clients as one of the most prominent names in the trading of Raita Masala. A mixture of high quality neat & clean ground spices to make Raita more tastier. You can make Raita of Boondi, Tomatto, Kakri, Kheera, Bathua, Onion, Pineapple, Pakori, Lauki, Podina, Pumpkin and also Dahibada, Dahi Pakori and Dahi Bhalla. add salt and prakash dahi vada/ rayata masala to curd and mix well. Put vadas to curd. Sprinkle chopped coriander leaves, to improve taste. It can be used in curd and rayata also. Our reputed entity is engaged in supplying Raita Masala. - Ingredients: Cumin seeds, coriander seeds, salt(black and white), Black pepper, Dry mango Mint. We are engaged in offering Chach Raita Masala. Our company has been successful in winning appreciation from the clients as one of the most prominent names in the trading of Raita Jeera Masala. 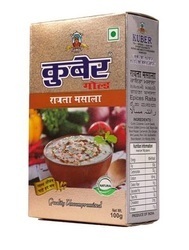 We are amongst the most reputed names in the industry, offering Karan Raita Masala. 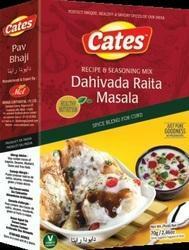 We are a top notch supplier of Catch raita masala.